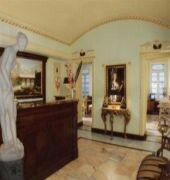 Set in an impressive 19th Century building, this elegant property is just two blocks from Roma Termini. A short walk from Rome major transport hub, the Champagne Palace Hotel is in a spot where travelers can go virtually anywhere within Italy. Located in the upcoming Esquilino district, the hotel is a 15-minute walk from the Colosseum and 20 minutes on foot from the Trevi Fountain; in fact, walking to most of the major Roman sights is easy from this position. The hotel is decorated in a traditional manner with prints by the Masters hung on the walls and an overall Baroque sensibility. The property includes a cozy lounge area where guests can regroup and a breakfast room that offers beautiful views over Rome. The CHAMPAGNE PALACE is a Tourist hotel. Located in ROME area. Shopping is within walking distance and the nightlife/restaurants are located in the hotel. 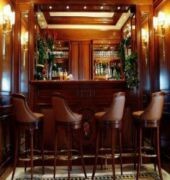 Descriptionclass="small" style="text-align: justify; font-size:11px;">Set in an impressive 19th Century building, this elegant property is just two blocks from Roma Termini. A short walk from Rome major transport hub, the Champagne Palace Hotel is in a spot where travelers can go virtually anywhere within Italy. Located in the upcoming Esquilino district, the hotel is a 15-minute walk from the Colosseum and 20 minutes on foot from the Trevi Fountain; in fact, walking to most of the major Roman sights is easy from this position. The hotel is decorated in a traditional manner with prints by the Masters hung on the walls and an overall Baroque sensibility. The property includes a cozy lounge area where guests can regroup and a breakfast room that offers beautiful views over Rome. Stayed at the champagne pallace from the 21st - 28th Feb ! Dated ' 1st room nothing worked ' changed to another room ' holes in the walls ' part of the door frame missing ' seal damaged on the shower so sprayed water every where ! Breakfast if you like cold over cooked grey eggs and powdered juice' stale bread and cheap sliced meat then this is the place for you ! Location by the main train station' not a good place to be around especially in the evening' rife with pickpockets and drug dealer ! Every evening I came back constantly ask if I wanted to buy drugs ! I'd personally avoid this hotel and location ! Whilst this hotel looks and is tired and could do with a facelift, it has all the basics that you need for a stay in Rome: comfortable bed, powerful shower, clean linen, continental breakfast in the price, great central location, (near the central train station and in walking distance of all tourist sights) and a very reasonable price. 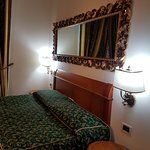 We enjoyed staying here for these reasons, and would recommend it if youâ€™re looking for somewhere central and reasonably priced to stay in Rome! Itâ€™s right that this hotel is tired and could do with a facelift BUT it has all the basics that you need for a stay in Rome: comfortable bed, powerful shower, clean linen, great central location (near the central train station and in walking distance of all tourist sights) and a reasonable price. We have just returned from a really cheap 2 night stay booked through Expedia and had a wonderful time. The Hotel is not your usual 4 star standard but it more than makes up for that with its friendly helpful staff and convenient location. The rooms are rather tired and our bathroom door had a large repair (piece of hardboard) stuck to it but they are clean and functional with a comfortable bed which is all you need. The breakfast is a typical continental with croissants, pastries, cereal etc and plenty of good coffee. If you want a hot breakfast there are plenty of places near by. The bus from the airport drops you at the train station and it's a five minute walk to the hotel. Most of the sights are within walking distance of the Hotel, 15 mins to the Colloseum, the same to the Trevi Fountain then a bit further to the Spanish steps, the location is brilliant. On our last day check out was at 10 am but we were able to leave our bags at the reception and do some more sight seeing before our evening flight home. We intend returning to Rome again and will definitely stay her again. Our room was so tired, ridiculous old. The bathroom is so small, my elbow hits the wall while showering. The elevator was also super small. Literally, fit just the two of us and our carryon bag. The only good thing is it comes with free breakfast and location. We stayed for one night and left.